Short term, OHF plan to carry out urgent remedial works and start using the building as it is. To facilitate this, their immediate goal, therefore, is to raise £30,000 through crowdfunding. Medium term OHF plan to restore the building to its former glory, creating two flexible performance spaces, plus office space and potential for open air events in the rear yard. Longer term, OHF aim to develop into the rear yard, and build a major extension that will house a much larger multi-purpose venue. Built in 1866 as a branch of the Belfast Bank, the building was acquired by the government in the 1950s, and repurposed as Bangor Magistrates Court. In the 1970s, it was listed as a Grade B2 building and in March 2013 decommissioned by the Northern Ireland Courts and Tribunal Service (NICTS), who fall within the Department of Justice NI. Bangor Shared Space began the campaign to acquire the Court House, and then passed the baton to Open House Festival in 2016, as the organisation best placed to acquire and re-purpose the building. Development Trusts NI have been supporting OHF throughout this long and complex process. The OHF team have submitted a detailed business case to the Courts Service (NICTS) proposing that ownership of the Court House should transfer to OHF at nil cost through the Community Asset Transfer (CAT) process. NICTS are currently considering that business case. If it goes ahead, this will be the first outright Community Asset Transfer of a building at nil cost since the launch of the CAT policy in May 2014. If OHF can successfully raise money for urgent repairs through crowdfunding it will greatly strengthen their business case, and they are hopeful NICTS will give a two 9 month leases, to move in, get the doors open and start running events. At the end of the 18 month lease period, once OHF have demonstrated that they can run the Court House as a viable concern, OHF are confident that the building will transfer to them permanently under the CAT scheme. If successful, this would be the first Community Asset Transfer in Northern Ireland, providing a valuable model for the transfer of other government buildings to better serve the community. The fact that Open House has shown a clear ability to attract outside visitors and increase spending within the town strengthens their case. In the festival month of August alone, they delivered 142 events creating £1.7m upturn in trade for the town. If OHF can successfully raise money for urgent repairs through crowdfunding it will greatly strengthen a separate related application for funding to the Heritage Lottery Fund to restore the building. They are also seeking partnership funding from a range of sources to strengthen that bid. Any money raised through the crowdfunding campaign, over and above those spent initially on urgent works, will go towards that partnership funding. And, importantly, will demonstrate to Heritage Lottery Fund that OHF have the support of the local community. The Heritage Lottery Fund is a two stage process that will take at least a year. If OHF are successful at both stages of their bid, they would hope that building works for the restoration will begin mid 2019 and be completed early 2020. Further down the line, OHF will be applying for additional funding to create the ambitious multi-purpose performance space to the rear of the building. 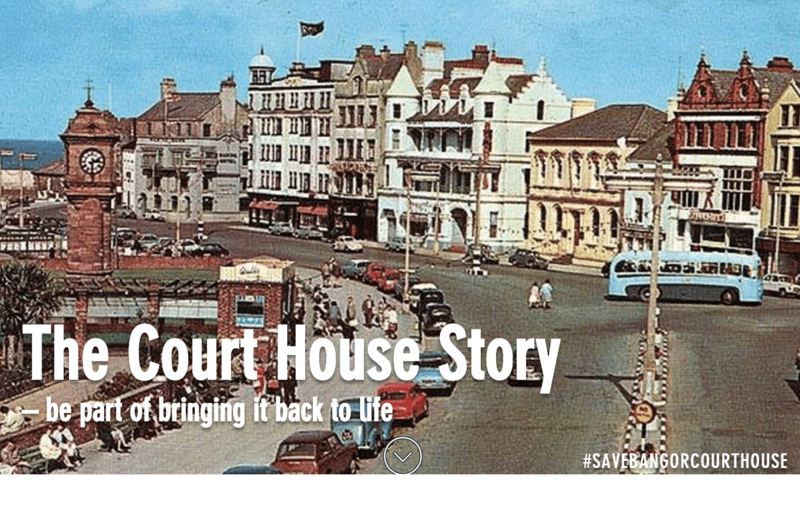 Acquiring the Court House would fit into OHF’s broader vision of “Creating a Creative Town” – a plan to regenerate Bangor town centre through arts and culture and re-make it as “The Brighton of the North.” This initiative is gathering momentum and attracting supporters from across the arts, business and community sectors. The refurbished Court House would serve as a centre for creative and cultural activity in the town, and would offer both a permanent home for Open House Festival, and a year-round venue for music, theatre, film, comedy, spoken word, book events and pop-up restaurant nights. In the immediate future, the large yard to the rear of the building will be a great open air venue, and in the longer term a large multi-purpose performance venue. This is a one-time chance to save this historic building and turn it into a catalyst for regeneration – a vibrant cultural and entertainment hub hosting a range of events for the wider community, and a highly visible landmark at the heart of a new “creative Bangor”. Open House Festival Ltd is a voluntary organisation, a registered not-for-profit charity with the Charity Commission NI and a company limited by guarantee.